Shares of the office supply superstore chain soared after Starboard Value disclosed that it had a 9.9 percent stake in Office Depot. The private equity firm also has a 5.1 percent position in Office Depot rival Staples (SPLS). Connecting the dots, reports indicated that Starboard will now push for a merger of the two retailers. 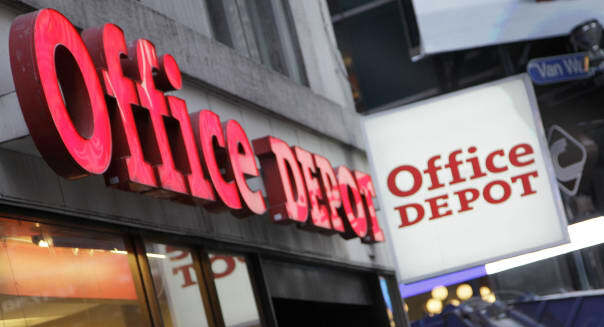 Office Depot has completed its merger with rival OfficeMax, and pairing up Staples with Office Depot would result in the three largest physical retailers of office goods being owned by the same company. That would normally trigger antitrust regulatory whistles, but the entire industry has been disrupted by online retailers offering competitive prices. Shares of Staples, for its part, soared 15 percent on the week. The upscale retailer of yoga apparel was a market darling until early last year when an embarrassing recall of its flagship Luon yoga pants eventually resulted in its once-popular CEO stepping down. The chain is still trying to battle back, but Lululemon gave investors a break last week by posting better-than-expected quarterly results. Not every analyst is convinced that a turnaround is taking place. The climate remains competitive. However, a couple of Wall Street pros still lifted their price targets on shares of Lululemon after the report. Another struggling retailer moving higher is American Eagle Outfitters. Oppenheimer analyst Anna Andreeva upgraded the mall chain on Tuesday. Andreeva was on CNBC, calling the chain "a better house in a not-so-great neighborhood," in a climate where lesser concepts are faring far worse. Nasdaq's biggest loser last week was Conn's. The consumer electronics retailer shed more than half of its value after stunning investors by posting a loss in its latest quarter. Analysts were holding out for a beefy profit of 68 cents a share. Conn's is seeing an increase in the number of late-stage delinquencies, even though it recently beefed up its lending standards. The growing number of deadbeat customers is forcing Conn's to post wider allowances for bad debt, resulting in the surprising red ink for the quarter. Shares of the provider of stock images took a hit after Adobe Systems (ADBE) announced that it would acquire a Shutterstock rival. Adobe's paying $800 million for Fotolia, and that's bad news for Shutterstock. Adobe plans to incorporate Fololia into its products, offering up its assortment of royalty-free images across the desktop publishing software giant's Web-based platform. Air carriers have been generally moving higher on the improving profit picture resulting from the plunge in oil prices, but Spirit Airlines is flying the other way. The discount airline warned that its planes are starting to fly emptier as legacy carriers begin taking advantage of cheap jet fuel to lower their fares. Spirit's load factor -- or the percentage of occupied seats on an average flight -- declined to 82.1 percent from 83.7 percent a year earlier. Motley Fool contributor Rick Munarriz has no position in any stocks mentioned. The Motley Fool recommends Adobe Systems and lululemon athletica. The Motley Fool owns shares of Staples. Try any of our Foolish newsletter services free for 30 days. Check out our free report on one great stock to buy for 2015 and beyond.